Emirati National Road Race and Time Trial Champion, Yousif Mirza, and team mate Kristijan Durasek took time out from their UCI WorldTour schedule to visit Abu Dhabi and lend their support to First Abu Dhabi Bank’s partnership with the Special Olympics World Games. The duo attended the finals of the Men’s 10km Road Race at Yas Marina Circuit and met with members of the UAE Special Olympics Cycling Squad. Mirza and Durasek – who are no strangers to the challenging cycling conditions that the riders have faced this week – provided advice and encouragement to the team and also congratulated a number of the riders on their medal winning achievements. 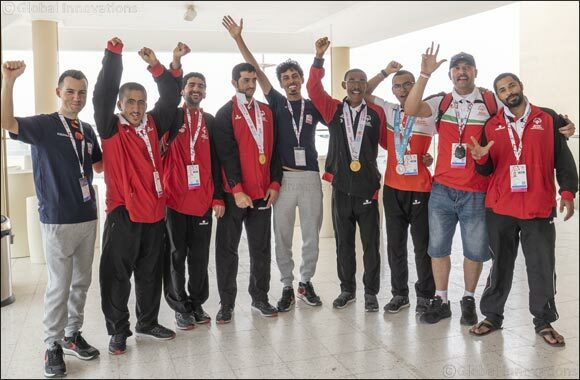 Over the past three days the UAE Special Olympics men’s cycling team has picked up a number of medals across a series of different cycling events. Their success began on Saturday when 16 year old Micha Hambleton took a Silver medal in the Men’s 2km Time Trial with a time of just 03:47”. Yesterday, his twin brother Jonah was able to go one better in the Men’s 10km Road Race (M02) with an impressive sprint finish that saw him distance the rest of the peloton by well over a minute and bring home the team’s first Gold medal of the Special Olympics World Games. A second Gold medal was then achieved by Abdulla Ali Aldhuhoori who also won his Men’s 10km Road race classification (M03). The UAE Team Emirates riders then took to the track at Yas Marina Circuit to participate in the Special Olympic Cycle Unified event, where they rode alongside members of the community with and without Intellectual Disabilities.